Kits for Juliette balconies that are suitable for commercial use. 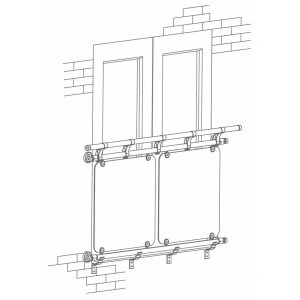 These balcony kits are designed to be easy-to-fit systems that are assembled into one piece that can then be lifted to the wall and secured using specially designed fixing brackets. These kits save valuable time on site and make balcony installation simple. These balconies are inspired by the popular Fusion range of stair parts. These Juliette systems feature the same combination of metal, timber and glass parts as the Fusion range, to create a contemporary balcony that’s ideal for houses, apartments or offices. The system features different sized glass panels and a range of handrail options to allow you to build your balcony exactly how you want it. These Juliette balconies offer you choices of timber or metal handrails, as well as an option to simply remove the handrail all together with the extra glass panel option. 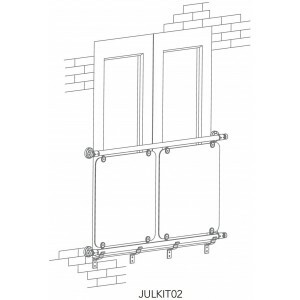 These Juliette systems are tested by FIRA to resist loadings of 0.74kN/m in line with building regulations. The balconies are intended for use on standard openings between 600mm and 2010mm wide. However, it is possible to achieve a minimum opening of just 250mm using a single small glass panel.